Advanced functionality and extra features for the PaperPort Notes app. 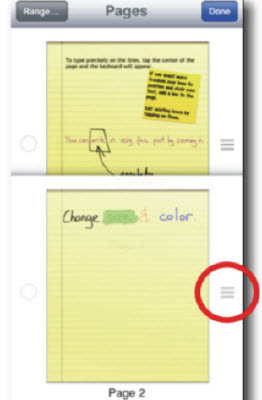 To reorder pages, tap the Edit button at the top right corner of the page list within a note. Use the move handle to drag pages to a new position. To delete pages, tap on the thumbnail of all pages you wish to remove, then tap the red Delete button. Use the clipboard to copy and paste pages between note sets. On the page list within a note, tap the Edit button in the top right corner. 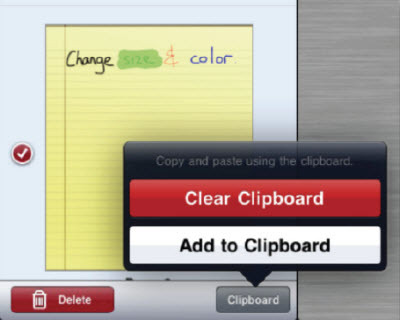 Select the pages you wish to add to the clipboard, then tap Clipboard and Add to Clipboard. After adding pages to the clipboard, you can paste them into note sets from the Insert menu on a page. You can plug your iPad into a monitor or projector to present your documents on a larger screen. Annotations will appear on screen as well. Activate Desktop Mode if you are having problems viewing a website in the PaperPort Notes WebSnap feature. This will make the in-app browser identify as Safari for Mac OS X instead of Safari for iPad. You can put a password on documents to prevent unauthorized people from viewing them. Before you share your document, tap the Protect button and enter a password. Palm protection can detect whether a screen touch is intentional or accidental. This works for both left and right handers. To help palm protection work properly, hold your stylus further from the tip, keep your palm to the side, and use the iPad in landscape orientation.